Sam Houston Race Park hosted 15 trials for the richest race of the 2019 Quarter Horse Meeting, the $459,700 Sam Houston Futurity (G2). The fifth trial of the card produced the fastest qualifier when Trump My Record returned to the winner’s circle with an impressive gate-to-wire victory under rider Eddie Sanchez, covering 330 yards in :16.566 seconds. The track was fast and he earned a 103 speed index assisted by a 10 mph tail wind. Bred in Texas by Fulton Quien Sabe Ranches LP, the son of first-crop sire Apollitical Blood out of the Pyc Paint Your Wagon mare Breck N Records is owned by Cruz E. Nava and trained by his brother-in-law Arturo Davila III. Purchased for just $10,700 at the TQHA Yearling Sale, he was victorious in the $254,070 Harrah's Entertainment Futurity (G3) on March 20 at Louisiana Downs after setting the fastest qualifying time in trials on March 2. Nava, a resident of Lytle Texas, also owned Shesa Diamond Diva, who ran second in the 2017 LQHBA Louisiana Million, earning $386,375 in 11 starts. As much as he has enjoyed the early success of Trump My Record, he admits that he has taken some flack on the name of his talented juvenile. It was big night for Davila and Sanchez who also qualified Pa Cha Ching for owner Pat Allen and Arturo Ibarra’s Mystic Lake, who set the tenth fastest time of :16.839 seconds in the fourteenth trial. Pa Cha Ching, a son of Tempting Dash, won the ninth trial in :16.616, which was the second-fastest clocking of the night. Allen owns the dam, Toole N Round, who won the TQHA Oaks and TQHA Sires’ Cup Stakes at Sam Houston Race Park in 2006 and 2007. Here is a link to the ten fastest qualifiers will return for the final of the Sam Houston Futurity on Friday, May 3 with the winner earning $183,880. Their name will be added to a distinguished list of past champions, including 2014 AQHA Champion 2-year-old colt, Kiss My Hocks; Azoom; Snowy Alibi, Ivan James, Especially Tres and This Is An Eagle. Seven trials for the $167,500 Sam Houston Derby were contested on Friday, April 12. The third trial produced the fastest clocking of the night when Eysa Jess Jumpn drew off by 2 ½ lengths as he covered 350 yards in :17.518 seconds. Rider Guadalupe Lucio, Jr. guided the daughter of Heza Fast Dash out of the Mr Jess Perry mare Jess Jumpn, who earned a 97 speed index. This was the seventh win from 10 starts for the talented filly, owned by Jose Estrada Quarter Horses and conditioned by Josue Huitron. Bred in Louisiana by Spring Hill Farms & Sherry Dunn, Eysa Jess Jumpn was a $11,500 purchase at the 2016 LQHBA Yearling Sale and is already closing in on the $433,000 earning mark. The 26-year-old Huitron and his younger brother, Joel, who serves as his assistant, loaded Eysa Jess Jumpn Friday night and headed back to Louisiana to attend the annual LQHBA Awards Banquet. Eysa Jess Jumpn will be honored as Champion 2-year-old filly and Huitron will pick up his first LQHBA Champion Trainer award. 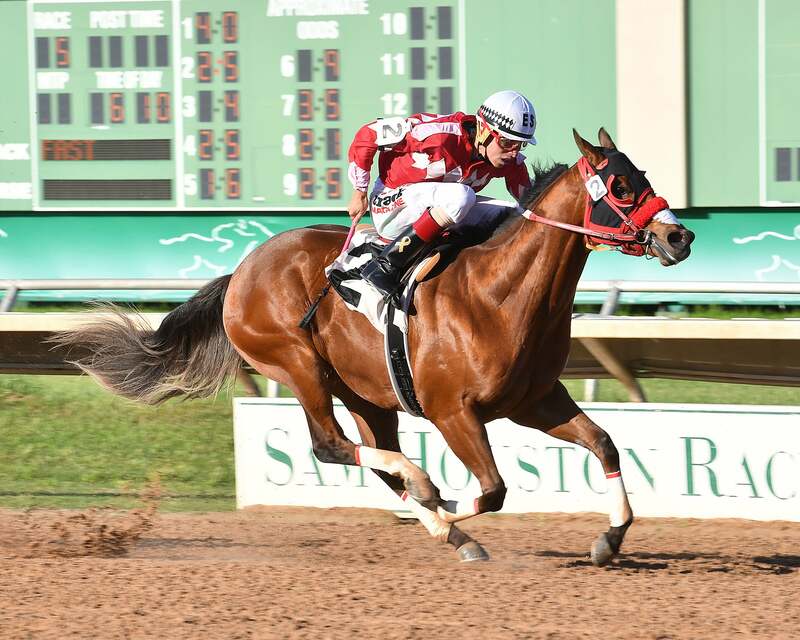 In addition to winning the Lee Berwick Futurity with Eysa Jess Jumpn, Huitron trains Larry Boudreaux’s Mpshinning who captured the richest race on the Louisiana Quarter Horse circuit, the LQHBA Louisiana Million last December at Evangeline Downs. Another Louisiana-bred invader Zoomin Patriot posted a 1-½ length win under jockey Ricardo Garza-Cruz in the fifth trial, setting the second fastest time of :17.630 seconds. The son of Jet Black Patriot was the first of three Sam Houston Derby qualifiers saddled by trainer Orlando Orozco. Racing for owner Claudia Avila, the black gelding won the 2018 Dash For Cash Juvenile at Lone Star Park. Orozco will also return with $406,000 Dash for Cash Futurity champion Paint Me a Sinner. The daughter of Pyc Paint Your Wagon is also owned by Avila and ridden by Ricardo Garza-Cruz. Mr Corona Crystal, a colt by Mr Jess Perry, owned by Hector Reza, completes the Orozco trio. 2018 leading Sam Houston Race Park trainer Leon Bard qualified LJ Moonrise, a filly by Separatist for owners P and J Racing Ltd. Bard’s first call rider Francisco Calderon was aboard for her win in the ninth race, where she set the third-fastest time of :17.649. Click HERE for a complete list of the ten fastest qualifiers. They will return for the final on Friday, May 3; the same night as the running of the $459,700 Sam Houston Futurity (G2). Friday and Saturday post times for the 2019 Quarter Horse Meet will be 7:00 pm (Central) with matinee racing offered on Monday afternoon at 12 noon. There will be a special post time of 1:00 pm for Kentucky Derby Day on Saturday, May 4 and the simulcast of the Preakness Stakes on Saturday, May 18. The 20-day meet continues through Saturday, May 25.